I've had several serious accidents. I paid my way by riding bikes. I am certainly in the top 10% of bike handlers on the planet, gas burning or push powered. I have millions of miles on all wheel types and sizes, and I promise you wheel size ain't the be all end all. But, I don't have any snazzy links or whatall, and I'm just an uneducated bum, so who even cares, anyway? Actually, I can't believe you guys get so worked up when an idiot like me runs off at the mouth. I had my scooter at 62mph yesterday, in fact, and I hit a large pothole. A square edged chunk of missing asphalt. Probably not like the real potholes where it snows. Oh, wait. It snows here, too... You guys get those great heaving chunks of asphalt scraped away by plows, too? Anyway, your statement that small wheeled scooters should not be going that fast remains wrong and ignorant. Also, a car hitting a pothole is NOT a bike hitting a pothole. And, everyone who is convinced large wheels are always better, and always roll through holes and over bumps better, should ride a 29er. Hahahaha. Marketing hype! I have a few motorbikes to ride, including a sportster, which I never choose. I also have, jeez, 15(?) push bikes at my disposal. Including a big, bad, full blown downhill bike my little buddy owns. I recently watched a guy who looks just like me make a run on a secret trail around here. What? I'm trying to get it all in before I crack. I do ride. Often. And all type of bikes. That was the point. Of course, it's only personal experience. You are entitled to your opinion.... but so am I, and my opinion doesn't make me 'ignorant'. Personal experience tells you what you enjoy riding, and that's all that really counts. Btw, the SV is my present ride. My first bike was a Honda 50 when I was 12. I'm not unfamiliar with 2 wheels, although I've always preferred burning dinosaur juice for power. Lack of knowledge and experience does. My opinion is that of a professional. Is yours? Were I a lawyer, for example, would my legal opinion be so questioned? Straight up: I've forgotten more about two wheeled vehicles than you ever learned. I paid my way through college twice racing and riding bikes. I will ride a big wheeled or small wheeled bike in circles around you any day, any place. My experience involves much more than riding for giggles. 15 mph is a good speed to see the world, 35 mph a good max speed for getting around. Bye Rob. You've become a jerk. And as you yourself said, who has time for jerks. Onto ignore. I re-read the thread, as I'm VERY careful about my words these days. I even had another person read them. I have read horrible insults on this forum when arguments happened. Horrible. The worst I said was ignorant, which means lack of knowledge. No insult to be ignorant of something. Somehow, in the course of defending my opinion, and explaining it, I became a jerk. I've said before many times, I don't understand people, and I'm crazy. I think you're right, and it's best I go. Apologies for ruining your party. This thread sure went to hell. First up, that thing is a nightmare. I own a 30 bike hire fleet and have another 10 or so bikes and scooters. I wouldn't touch those things with a barge pole. No doubt they would be much more expensive than gas and not usefulfor your application. How is the air in Chiang Mai? As I've said, all other factors being equal, smaller wheels fare more poorly on potholes. However, this can be greatly mitigated with suspension design by using a trailing arm suspension with a good inclination to the roadarm (the wheel center much lower than the roadarm pivot point); Then, when the wheel drops down into a pothole and impacts the front face, or hits a bump in the road, as the wheel rises, it also moves aft, greatly reducing the dynamic shock forces. Angled trailing arms are very good for off-road; early dune buggies and baja racers used VW Beetle suspensions with trailing arms, and when jacked up, provided the needed arm inclination. The drawbacks of trailing arms on the front of vehicles is that they have no anti-dive, in fact are "pro-dive", pulling the body front down under braking. And, they don't have the necessary camber change with vehicle roll to provide good handling. Most aircraft designed to land on dirt/semi-improved runways use a trailing arm suspension. Modern tanks use trailing arms supporting the tracks. What you say is undoubtedly true... but I don't think even advanced suspension geometries can totally mitigate the effect of a small wheel hitting a big pothole. Others might want to do 60+ mph on a small-wheeled vehicle... but I'll pass, thank you. The air in Chiang Mai is pretty crappy this month, thanks for asking. That's mostly due to the farmers who produce corn that is converted to ethanol for green fuels. They burn the stubble from their last crop. They also burn in the national parks, just because. I suspect they think they might be allowed to sneak a corn crop in there. Cost didn't come into my comment about not touching them. They aren't a good design. I've looked at some e-bikes with a view to adding some to the fleet.... but they aren't "there" yet. We will keep burning corn, with some dinosaur blood mixed in, for a while yet. I said mitigate, not eliminate. And trailing arms are not what I would call "advanced", it's one of the first, and most primitive, of independent suspension designs. What is also cool is remote sensing technologies to sense the pothole in advance, and then "skyhook" the suspension using dampers and roll and pitch couple, to not let the wheel drop into the pothole to begin with. That only requires "semi-active" dampers. To lift the wheel over a bump, requires full active suspension. I recall seeing a suspension system by Bose, IIRC, the vehicle driving over lateral spans of wood, the wheels moving, the body not. The guy in the red tee is riding the Honda Grom... has 27,000 on it now and just arrived - Sweden to here via the usual - Iran, India, Myanmar, etc. The guy in the yellow tee came in at the same time, same basic route but from Spain. 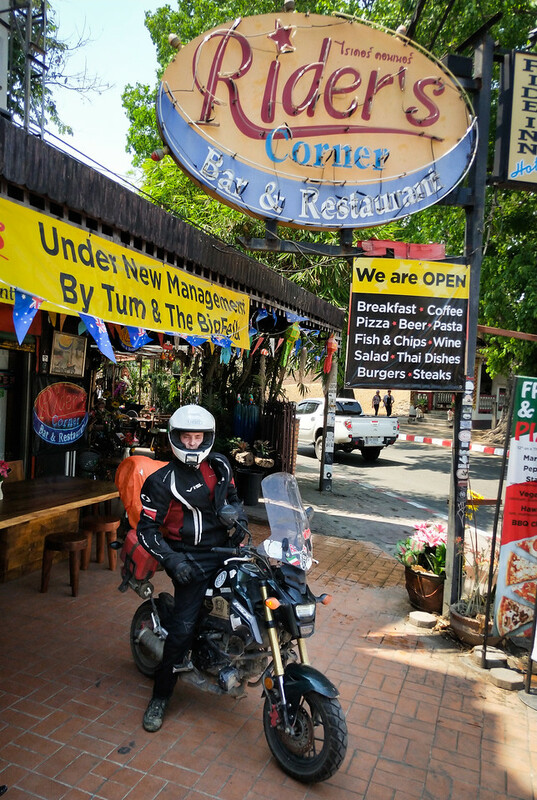 He's on a BMW Sertao 650 - basically the same as the old Funduro I used to ride (and the Dakar I have here). Niklas, on the Grom, is headed to Malaysia, then shipping the bike to Africa. A Belgian mate who lives here lived and rode in Africa for many years (he was based in Burundi, but rode the Congo, etc). His first comment was... "you won't make it through the ruts with those small wheels". The usual suspects are avidly supporting my decision to put them on IGNORE. Anyhow, someone posted about an e-scooter called Gogoro, that looks good, except it requires a proprietary charging station. That would work for urban areas, but not where I live. Being able to charge from a home outlet is the first checkbox on my list. Second is highway speed. Third is range, at least 100 k or better. ^^ Huh, I thought the Grom was a scooter style. I've read great tales of low cost touring on Groms. Yes, those small wheels will be no match for deep ruts or very low traction conditions. But on pavement or hardpack, not only is a Grom good for newbies, but especially so for someone that chap's size, and myself. Last edited by C.Collins; 04-14-2019 at 07:27 PM. nope, not an arbiter, Katherine has standards and some people are a sequence of asterixes. Her standard of civility seems, substandard.